THE MSG says while it respects the sovereignty of Indonesia over West Papua, it will still vigorously pursue the reports of the violation of human rights in the country that is struggling for self-determination. Allegations of gruesome human rights abuses perpetrated by Indonesian armed forces on West Papuans have been widely reported, however, no concrete action has been taken to bring those responsible to justice. 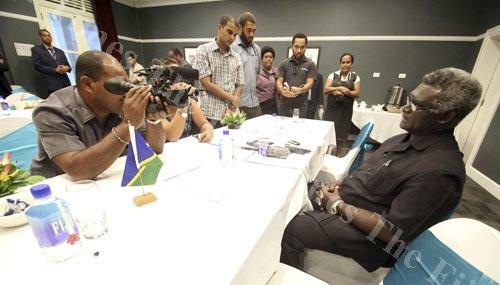 But MSG chairman and Solomon Islands Prime Minister Manasseh Sogavare said the abuses were something they could not shy away from, even though they recognised that Indonesia had authority over West Papua. "The matter of self-determination is a matter between the West Papuans and Indonesia to discuss. But when it comes to human rights violations, I think we can and we have a duty as members of the UN to express our views and concerns and we hope the President of Indonesia will respect that for the good of all. "All right thinking people of planet earth should be able to express concern when a race is persecuted for what they believe in for expressing their thinking and expressing how they want to organise themselves," Mr Sogavare said. He said they continued to encourage the Pacific Islands Forum Secretariat to send an independent fact-finding mission made up of NGOs and churches to West Papua to find out more about the human rights violations. "Now that has yet to happen, in my latest discussion with the Prime Minister of Papua New Guinea, he said he is still talking with his counterpart the President of Indonesia on how we can get that fact finding mission to Indonesia." Mr Sogavare said the MSG's main concern was to ensure the integrity of the fact-finding mission and to do that, the mission would need to be independent of all governments. He also explained the Indonesian Government needed to allow the mission free access to follow up the allegations of abuse. "We have reports of it we have reports of the last ten years of violations. It's with me as chair of the MSG, two volumes and our concern is that fact-finding mission must be allowed to do it's work freely. "And we also expressed and jointly agree that it is good for Indonesia that we discuss this openly and they to allow this fact-finding mission and we would like to make it very clear to Indonesia that we respect Indonesia's sovereignty over West Papua and that's a position that we take both in the MSG and the Pacific Island forum." Mr Sogavare said he planned to visit Indonesia in April and encourage the leadership talks with the West Papuans, the first peaceful talks in 50 years.